When I was a kid, I used to build little forts everywhere. Indoors it would be sofa cushions and chairs with a blanket thrown over top. Outdoors it would be under a low tree or deep in bushes, with scavenged plastic or cardboard upon which to sit. It seems Nala takes after me. We knew that she loved to play with the blue sheer fabric. As the weather speeds towards winter she is spending less time outdoors, and is getting a bit stir crazy. One day this past weekend I was busy and she needed a diversion. 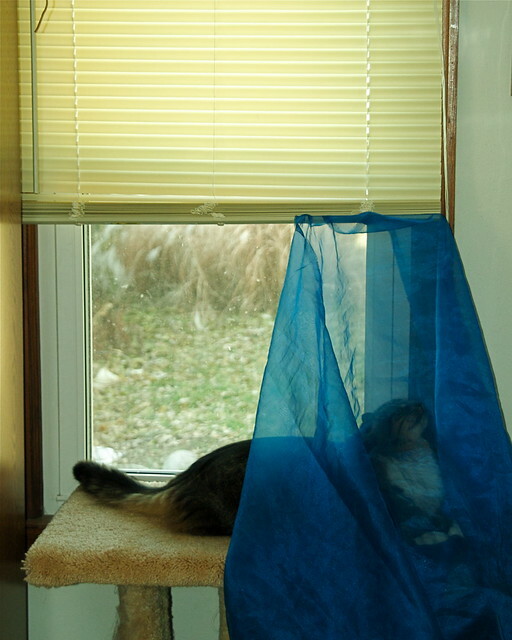 I dug her fabric back out (it is now clearly hers) and tucked it into the mini-blind leaving her window perch partially covered. She sits up there, either wholly behind the fabric, or partially as in this photo. Whether she is keeping tabs on the backyard through the window, or facing in towards our office, she is clearly content.